A regular breeding species and migrant; not reported every winter but is a winter visitant some years, when only one or a few birds are reported during the entire season. The Yellow-headed Blackbird was a common species during the Minnesota Breeding Bird Atlas (MNBBA). Restricted primarily to western North America, stretching only as far east as the Great Lakes, the core of the Yellow-headed Blackbird’s breeding range is in the Prairie Potholes of central North Dakota (Figure 1). Assigned a Continental Concern Score of 9/20 by Partners in Flight. Designated a Species in Greatest Conservation Need by the Minnesota Department of Natural Resources and a Target Conservation Species by Audubon Minnesota. A medium-distance migrant wintering in the southern United States and Mexico. Diet is composed primarily of insects during the breeding season, foraging on the ground or at the water’s surface; seeds and waste grain are consumed the remainder of the year. An open-cup nest secured to emergent, wetland vegetation; frequently breeds in large colonies. Breeding distribution and relative abundance of the Yellow-headed Blackbird in North America based on the federal Breeding Bird Survey from 2011 to 2015 (Sauer et al. 2017). In the early 1900s, Roberts (1932) considered the Yellow-headed Blackbird to be a common summer resident throughout the “open country” of the western grasslands. Although this constituted its primary range, it also could be found along the perimeters of the northern forest wherever suitable wetlands were present. Indeed, nesting colonies were found as far north as Leech Lake in Cass County, at the mouth of the Rainy River in Lake of the Woods County, and near Duluth in St. Louis County. Confirmed nesting reports (nests with eggs) were available from 8 counties: Big Stone, Hennepin, Jackson, Kittson, Marshall, Otter Tail, Polk, and Sherburne. Inferred nesting reports (nest building) were available from Goodhue and Nobles Counties. More than forty years later little had changed. Green and Janssen (1975) described nearly an identical breeding distribution, further clarifying the species’ absence from most of northeastern Minnesota, including Itasca and Koochiching Counties in north-central Minnesota and Pine and Aitkin Counties immediately to the south. A few years later, Janssen (1987) reported the species appeared to be expanding its range into the northeast region of the state. There even were June records documented from Cook County but these were presumed to be summer vagrants. In 1998, Hertzel and Janssen documented a total of 42 counties where Yellow-headed Blackbirds had been confirmed nesting since 1970, ten more than Janssen had identified in 1987. A similar distribution was documented by the Minnesota Biological Survey, although no breeding season locations were found in the Arrowhead’s northeastern counties (Minnesota Department of Natural Resources 2016). During the MNBBA, participants reported 1,426 Yellow-headed Blackbirds records in 16.8% (800/4,753) of the atlas blocks that were surveyed and in 20.5% (480/2,337) of the priority blocks. Breeding was confirmed in 110 blocks (Figures 2 and 3; Table 1). The birds were reported from all but 8 of Minnesota’s 87 counties: 4 in northeastern Minnesota and 4 in southeastern Minnesota. Breeding was confirmed in 47 counties; Red Lake County was included because of a block that straddled both Pennington and Red Lake Counties. Eighteen counties were additions to the list compiled by Hertzel and Janssen in 1998: Blue Earth, Carver, Chippewa, Cottonwood, Dakota, Douglas, Faribault, Freeborn, Isanti, McLeod, Murray, Nicollet, Norman, Polk, Otter Tail, Sibley, Swift, and Traverse. The species was most frequently reported from the central and southern regions of the Prairie Parklands Province. Historically few changes have been documented in the species’ breeding range, with the exception that some accounts suggest it may be slowly spreading eastward. For example, breeding populations in the Great Lakes regions were not documented until the mid-1900s, and the number of reports further east and as far south as Florida have increased in recent years (Twedt and Crawford 1995). In Minnesota, the species’ breeding range seems relatively unchanged in the past 100 years. Although there are a few summer reports from far northern St. Louis and Cook Counties, the species is still quite rare in the northeastern and north-central regions of the state. Atlas data were also used to generate a model that predicts the relative abundance of Yellow-headed Blackbirds across the state (Figure 4). Tightly associated with suitable emergent wetlands, the species is predicted to be most abundant in the west-central and southwestern regions of the Prairie Parkland province with densities declining rapidly further north and east of the province. Breeding distribution of the Yellow-headed Blackbird in Minnesota based on the Breeding Bird Atlas (2009 – 2013). Summary statistics of observations by breeding status category for the Yellow-headed Blackbird in Minnesota based on all blocks (each 5 km x 5 km) surveyed during the Breeding Bird Atlas (2009-2013). Summary statistics for the Yellow-headed Blackbird observations by breeding status category for all blocks and priority blocks (each 5 km x 5 km) surveyed during the Minnesota Breeding Bird Atlas (2009-2013). Predicted breeding distribution (pairs per 40 hectares) of the Yellow-headed Blackbird in Minnesota based on habitat, landscape context, and climate data gathered during the Minnesota Breeding Bird Atlas (2009-2013) using the General Linear Modeling method with an adjustment for detectability. In Minnesota, the Yellow-headed Blackbird is primarily a species of deep freshwater marshes and dense beds of emergent vegetation found along stream banks and lake shorelines (Figure 5). Sites that become dry during the nesting season are promptly deserted. Productive, high-quality wetlands with dense stands of emergent vegetation (cattails or bulrushes), interspersed with channels of open water, are generally preferred. One study concluded that territories were least likely to be established in wetlands where shoreline trees projected more than 30° above the horizon (Orians 1980). Data collected within 200 m of MNBBA point counts where Yellow-headed Blackbirds were detected confirmed the species’ strong association with emergent wetlands. Typical breeding habitat of the Yellow-headed Blackbird in Minnesota (© Lee A. Pfannmuller). Habitat profile for the Yellow-headed Blackbird based on habitats within 200 m of point counts where the species was present during the Minnesota Breeding Bird Atlas (2009-2013). Monitoring data gathered by the federal Breeding Bird Survey (BBS) have been used to generate a North American population estimate of 15 million birds (Rosenberg et al. 2016). Several years ago, the Minnesota population was estimated to be 2.7% of the total U.S. population (Partners in Flight Science Committee 2013), which would be approximately 405,000 birds. The statewide estimate generated with MNBBA data is 549,000 breeding adults. The confidence intervals for this highly colonial species, however, were quite large lending a high degree of uncertainty to the estimate. Overall, the Red-winged Blackbird is nearly 16 times more abundant than the Yellow-headed Blackbird. Although the species is well distributed across western and southern Minnesota, the core of its breeding range is found just to the west in central North Dakota (Figure 1). The average number of Yellow-headed Blackbirds found along Breeding Bird Survey (BBS) routes in North Dakota is 334 compared to 31 in Minnesota (Sauer et al. 2017), creating a rather steep gradient in abundance. South Dakota is the only other state where they are more abundant than Minnesota, with an average of 134 birds per route. In Canada, the species is most abundant in Saskatchewan with an average of 71 birds per BBS route. Since the BBS began in the mid-1960s, data collected survey-wide demonstrate a nearly stable population from 1966 to 2015; this trend has changed considerably in the most recent ten-year reporting period (2005–2015), and the population is now increasing 1.88% per year. Most of the population increases are occurring in the western United States and the interior of the northern Great Plains, while most localities in the Central Plains are declining (Figure 7). Contrary to the national trend, Yellow-headed Blackbird populations in Minnesota have declined significantly—an average annual rate of 1.86% per year since 1967—for a cumulative decline of nearly 84% (Figure 8, Sauer et al. 2017). This broad scale trend is similar to that observed among many of Minnesota’s wetland-dependent species that occur in the western and southern regions of the state. Although populations are recovering west of Minnesota, in the core of the northern Great Plains Prairie Pothole region, here they are continuing their downward trajectory. Factors responsible for local declines of the Yellow-headed Blackbird are often attributed to periodic droughts, loss and degradation of habitat, and, because of its consumption of waste grain, the impact of pesticides and herbicides. Many of the marshes selected for breeding are embedded in regions with intensive agriculture, and drift from aerial chemical applications may pose both direct and indirect impacts (Twedt and Crawford 1995; Kreitinger et al. 2013). Significant wetland loss and degradation in Minnesota have certainly contributed to the species’ long-term decline. In east-central Minnesota, where wetlands are surrounded by urban and industrial development, these basins frequently receive heavy run-off during rain events, leading to sudden rises in water levels that can kill emergent vegetation upon which the blackbirds depend. Indeed, a lack of emergent vegetation was cited as one of the primary factors responsible for the decline of the Yellow-headed Blackbird in Ramsey County (Jenness 2001). Regional Population Trends of the Yellow-headed Blackbird, 1966-2015 (Sauer et al. 2017). 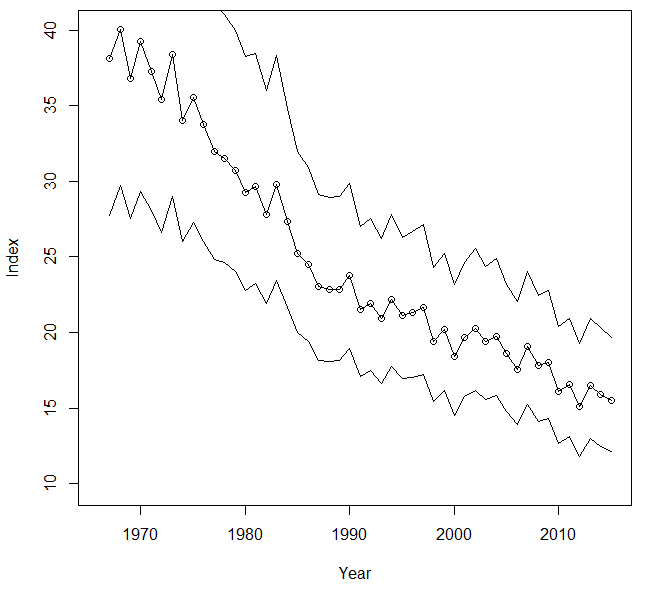 Breeding population trend for the Yellow-headed Blackbird in Minnesota from 1967-2015 based on the federal Breeding Bird Survey (Sauer et al. 2017). With a moderate Continental Concern Score of 9/20, the Yellow-headed Blackbird is not a high conservation priority at the federal level (Rosenberg et al. 2016). Although it is not state listed, it was recently recognized as a Species in Greatest Conservation Need because of its declining population and the loss of suitable habitat (Minnesota Department of Natural Resources 2015). Audubon Minnesota also designated it a Target Conservation Species in the state and prepared a statewide conservation plan (Pfannmuller 2014). The most important conservation action needed in the state is an aggressive partnership between resource agencies and conservation organizations to protect and restore wetland habitats. Especially important is an emphasis on deep water marshes that support diverse stands of emergent vegetation interspersed with equal areas of open water; such sites are also known as hemi-marshes. Incorporating wetland goals established for Minnesota by the Upper Mississippi River/Great Lakes Joint Venture Plan (Soulliere et al. 2007) and the Minnesota Prairie Landscape Conservation Plan (Minnesota Prairie Plan Working Group 2011), the statewide Conservation Plan for Yellow-headed Blackbirds established a goal of protecting approximately 80,000 acres of wetlands and restoring approximately 107,000 acres (Pfannmuller 2014). Wetland loss and degradation are not the only threats to establishing and maintaining sustainable populations. Warming temperatures also pose a significant challenge. The 2010 State of the Birds Report predicted that the species had a medium vulnerability to climate change (North American Bird Conservation Initiative 2010). More recently, an extensive analysis of the response of 588 North American birds to climate change by the National Audubon Society classified the species as “climate endangered”, predicting that by the year 2080, the Yellow-headed Blackbird could lose 68% of its current breeding habitat and 64% of its current winter range. Hence, climate change would compound the problems the species already faces from habitat loss and other factors (Langham et al. 2015; National Audubon Society 2016). Like many of Minnesota’s wetland species, the future of the Yellow-headed Blackbird is clouded by both habitat and climate concerns. Intensive interagency collaboration at the local, state, and federal levels to address these issues is critical to the future of this emblematic wetland species in Minnesota. Jenness, Doug. 2001. “Last Stand of the Yellow-headed Blackbird in Ramsey County.” Loon 72: 232–234. Orians, Gordon H. 1980. Some Adaptations of Marsh Nesting Blackbirds. Princeton, NJ: Princeton University Press.